Macquarie University researchers have led the design and construction of a new system that can be fitted to a custom-built, waterproof drone in order to sample whale microbiota – the combination of natural bacterial colonies that live in an organism – by flying over and collecting the exhaled vapours from their blowholes. The collaborative research project, which involved an array of experts including drone pilot and engineer Alastair Smith from Heliguy Pty. 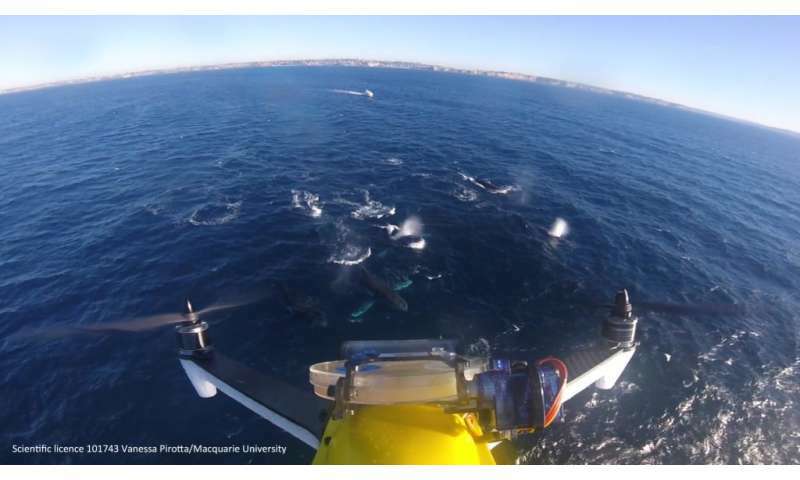 Ltd., Sydney, sea vessel experts, microbiologists and marine biologists, used the customised drone collection technique in order to monitor the health of whales in a non-invasive manner. "In conjunction with drone experts, we have developed a low-cost system which incorporates a sterile petri dish with a remotely operated and novel 'flip lid'. This can be attached to a drone along with a GoPro camera in order to sample whale blow with minimal disturbance to the whales," explained lead researcher Vanessa Pirotta from Macquarie University. "This system allowed us to collect samples safely and reliably, by minimising external contamination such as air and seawater from outside the blowhole," Pirotta added. Whereas previous collection of mucus from whales has involved taking samples from beached animals, where their health is already compromised, or from a boat which comes with its own set of risks, such as close approaches to very large animals, the researchers in this study were able to non-invasively collect mucus microbiota samples from 59 actively northward migrating humpback whales off the coast of Sydney. They then extracted bacterial DNA in the lab and sequenced the samples to identify the specific bacteria present in a sample. Interestingly, in addition to having bacteria that is usually found in mammals, the humpback whales were also found to have bacteria in their blow mucus from non-mammalian species. "We were able to see that many of the whales had types of bacteria that are found in the respiratory tracts of dolphins and oral cavities of other mammals, but we also found some bacteria that has been associated with fish," Pirotta explained. The researchers say that by understanding the microbiota that lives the blow mucus of healthy whales, they will be able to monitor changes in individuals and entire populations which could connote a change or decline in health. "Gathering baseline information of whale lung microbiota provides a snapshot of health information from an animal that is uncatchable. This means we will be better able to monitor the health of recovering whale populations over time and look for changes in their environment. We also hope to adapt this method to learn more about the health of other species such as the much smaller Southern right whale population," said Pirotta. As for the research team's future endeavours, Pirotta says that they are keen to see how drones could help them learn about other aspects of whale health and ecology. "In the marine environment, drones are revolutionising the way we study marine species. Due to their small size, the fact that they cause minimal disturbance to wildlife and offer improved safety for both operators and animals, makes them an attractive option for studying marine wildlife. In addition to collecting health information, we were also able to capture a different perspective of whale behaviour off Sydney not seen from a boat. We saw whales interacting with each other underwater and huge numbers of dolphins escorting whale pods as they travelled north. We hope to optimise our device, and develop new ways to answer questions about whales and other marine species as well," Pirotta concluded.